A New Clinic, New Services, New Location but the same Great Treatment and Awesome Acupuncturist! I can’t wait for you to check out and see the new clinic, the new design and the amazing new services (including personal fitness training on my exclusive 5 minute gym), and digital meridian graphing (yep I’ll actually be able to directly SHOW you those meridians I keep telling you about), and there’s much more planned. 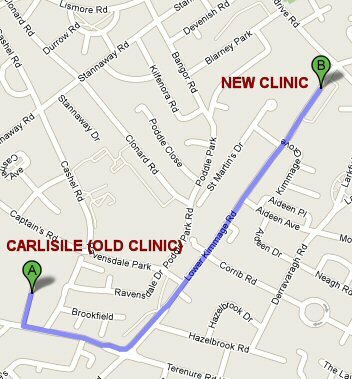 Best of all, the new clinic is only a 5 minute walk from Carlisle Health and Fitness (my old practice)! Check out the map below. 175a Lower Kimmage Road, Dublin 6w. There's plenty of parking outside and also in the Superquinn car pack nearby. It's also serviced by a number of bus routes including the 54A and the 54N. It's also within easy walking distance of the 18 and 83 stops. I’ll be opening the new clinic Monday 7th June few and all appointments will be seen there from Monday on. Join me in this new start with new opportunities for you to strengthen and develop your health!